Ash Cottage in Oscroft, near Chester sleeps 4 people. Set in this quiet hamlet, adjacent to the owner’s house, this cosy holiday cottage enjoys many pretty touches. There is a lawned area to the front of the property for relaxing in the evenings on the patio area. Seven miles from the historic city of Chester and with North Wales and the Peak District close by for an alternative day out. Golf course 1 mile, horse riding locally. Excellent cycling and walking area (Sandstone Trail). Shop and pubs 1½ miles. Set in this quiet hamlet, adjacent to the owner’s house, this cosy holiday cottage enjoys many pretty touches. There is a lawned area to the front of the property for relaxing in the evenings on the patio area. Seven miles from the historic city of Chester and with North Wales and the Peak District close by for an alternative day out. Golf course, ¼ mile, horse riding. Excellent cycling and walking area (Sandstone Trail). Shop and pubs 1½ miles. Ground floor: Dining room/kitchen. First floor: Living room. 2 bedrooms: 1 double, 1 twin. Bathroom with shower attachment and toilet. Oil central heating, electric, bed linen and towels included. DVD/CD. Electric cooker. Microwave. Washing machine. Patio and picnic table. Use of lawned paddock. Parking (1 car). Holidays at Ash Cottage run from Saturday to Saturday. 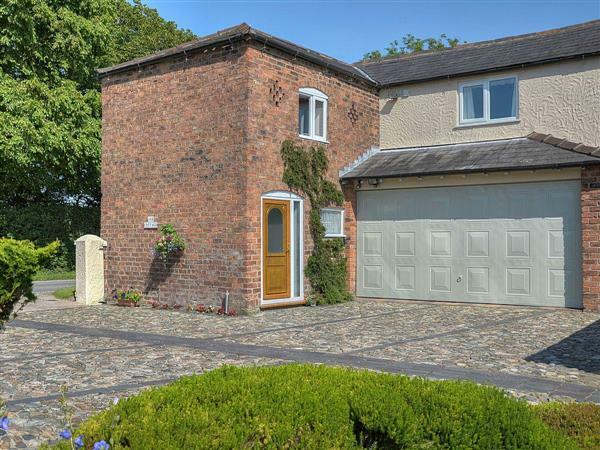 Ash Cottage is in Cheshire; should you be on the lookout for a special offer, you can find all the special offers in Cheshire. It's always worth checking to see what is on offer at the moment. Do you want to holiday near Ash Cottage (13230), you can see other cottages within 25 miles of Ash Cottage; have a look to find your perfect holiday location.